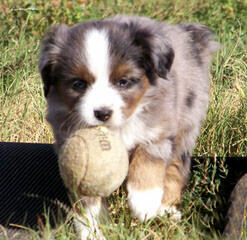 Our goal at Circle D is to produce healthy Miniature Australian Shepherd puppies with the best bloodlines. 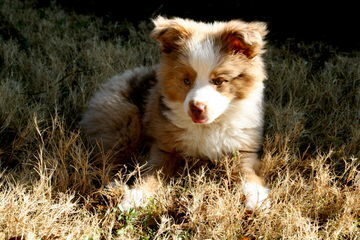 All of our Mini Australian Shepherd adults are out of a Champion. Our stud, Black Night aka Spike, is a Natl/Intl Champion. His sire is a Multi-Champion. Our backup stud, Mick, parents are both International Champions. All our dogs are ASDR registered. 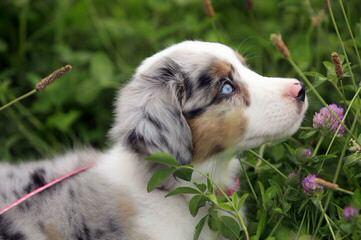 We health test our adults with Paw Print Genetics to guarantee healthy puppies. We live in the beautiful mountains in Montana. Our dogs are our babies and live in the house with house us as part of our family! 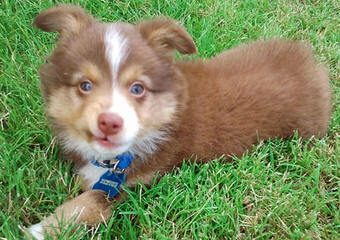 We breed Toy Australian Shepherd and Aussiedoodles! Parents have had their genetic testing completed! We have Available puppies at this time! 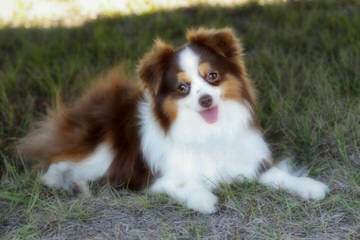 We have been a quality breeder of Mini and Toy Aussie’s for well over 10 yrs. 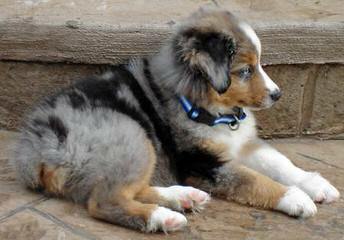 We strive to produce dogs and puppies that adhere to the “breed standard” of Australian Shepherds – including correct ears, heads, coat colors, conformation and superb temperaments. All our dogs have been genetically tested and are clear for PRA<HC<CD and MDR1. Puppies are raised in our home, litter box trained and very social. We are not a kennel but a small breeder with only a few dogs. Aussies of the Smaller Variery. All genetic health testing done. I don’t dock tails because I don’t believe in it. 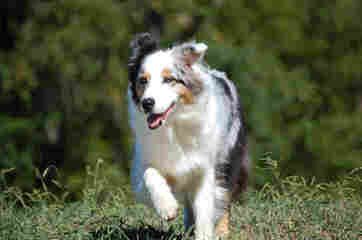 My pups do well in Agility, therapy/service dog programs, obedience, herding, and most of all excell as family pets. 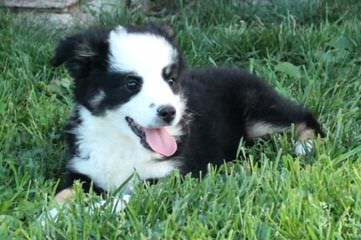 Miniature Australian Shepherd Puppies for sale in Calistoga, Northern California with International Champion blood lines. 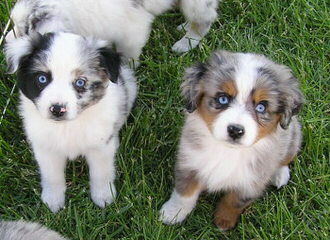 Blue Merle’s and Black Tri Miniature and Toy sized Australian Shepherd puppies. Great with kids, animals, ranches, and guarding your home & family. Our puppies are all seen by a Veterinarian for tails, dewclaws, vaccinations, worming, and health check ups. The puppies come with a 1 year health guarantee and $75 will be refund for spay & neutering your puppy. We are a small breeder located in Calistoga (Napa Valley) in Northern California. Servicing Napa Valley, Calistoga, Sonoma, Santa Rosa, Novato, Marin, San Mateo, San Francisco, Milpitas, San Jose areas. Please have the time, love, patience, and a fenced yard or open land for these cuties! 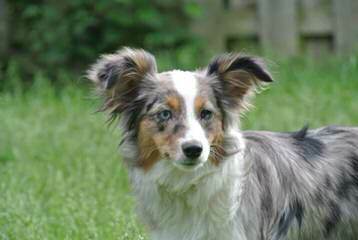 74 Ranch is a small breeding program promoting the Mini Aussie breed. We do conformation and performance events. We personality test the pups at 8 weeks then place accordingly. Parents are health tested. Most are champions or above and have titles in several performance events. MASCA and/or ASDR registered. Several litters per year. Website is always up to date! 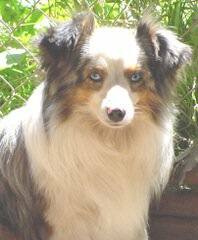 We breed both the Miniature Australian Shepherds & Miniature American Shepherds, we breed for true Aussie type in a small package, Miniature Australian Shepherds make excellent family pets, please check out our website for more information! 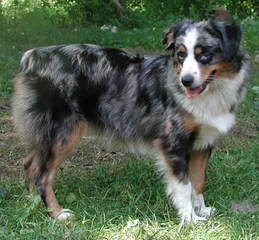 PRIOR TO BREEDING AUSSIES, WE WERE BREEDING LABS FOR 12 YEARS. 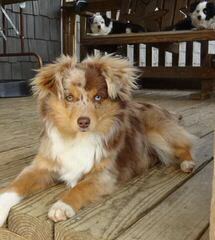 WE BREED OUR AUSSIES ON OUR 4 ACRE FARM IN MILLS RIVER, NC. 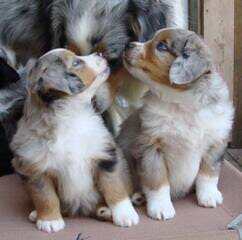 WE ARE CURRENTLY EXPECTING A LITTER OF MINIATURE AUSTRALIAN SHEPERDS AS EARLY AS 10/6/13; THEY HAVE ALL THREE COLORS IN THEIR GENES (RED MERLE, BLUE MERLE AND BLACK TRI). 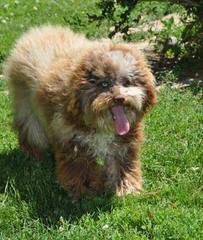 OUR DOGS ARE ASDR REGISTERED AND ARE CURRENT WITH ALL SHOTS, WORM TREATMENTS AND VET VISITS. 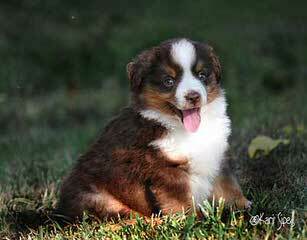 I am a Mini Aussie and Mini American Shepherd puppy Breeder. My pups are lovingly raised in the spirit of their Western American Heritage in the foothills of the beautiful Superstition Mountains of Arizona. The puppies are all bred from Champion Bloodlines for pure enjoyment, love of the breed and strong commitment for quality not quantity. Each litter I commit to produce puppies that meet the highest breed standards. Please call or email anytime with questions. 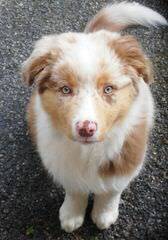 Here at R Star Miniature Aussies we strive to produce small miniature aussies with the type and structure for the show ring while at the same time the temperment for the perfect family pet. We only raise a few litters a year to make sure that the puppies get the attention they need to be happy and healthy. Come see us and see if one of R Star puppies would be right for you! 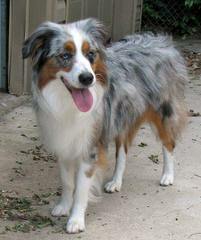 We breed for “Quality” Miniature Australian Shepherds. We are a small Hobby breeder and only have 3-4 litters per year. All of our puppies are hand raised and come with a complete Health Guarantee. Parents have had their genetic testings to assure that we are breeding for the best possible Pet/Companion puppies for their Lifetime. Please visit our website for more info. 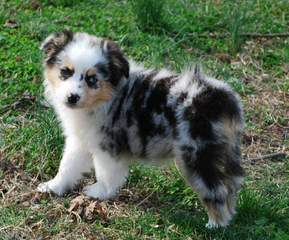 We are a small hobby breeder dedicated to the development and benefit of the Miniature Australian Shepherd (Mini Aussie). 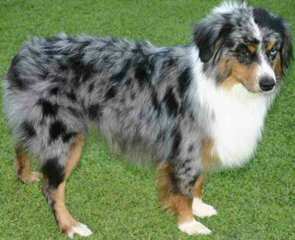 Designer Aussies goal is to produce Champion companion pets, obedience, agility, and show quality dogs. We strive to produce puppies in a beautiful compact show quality package designed with kustom chrome. Puppies begin with solid foundations(pedigree, genetics, preventative health care, nutritious food,socialization and training. Our puppies are raised in our home,vaccinated for Bord, DHLPPC,and Rabies, Eyes cerfed, Home Again Chip, and on Sentinel heartworm preventative. Check out the precious puppy pictures on our website. Call now*****We look forward to talking with you. 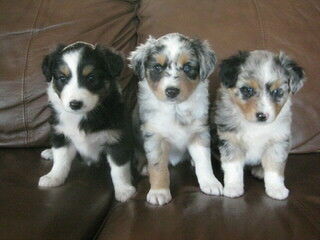 Raising Gorgeous Miniature and Toy Australian Shepherds and also the amazing non-shedding Aussiedoodle! See my website for current puppies and info. Our Mini and Toy Australian Shepherds are our personal pets, have all health clearances, and puppies are raised in our home environment, not a kennel setting. We train obedience, agility, disc dog and show conformation. Please visit our webpage for additional information and pictures. 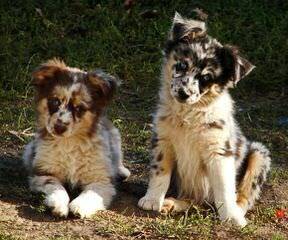 Alangus Aussies–Pack ’em up and Take ’em along!! We have puppies available from 400.00 and up. 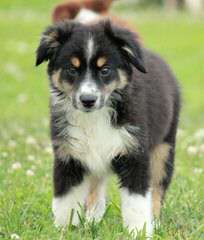 They are registered with AKC, ASDR, or NSDR. The parents have their health clearances and all puppies have had their shots and are on a worming program. 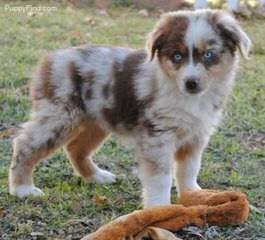 We are a Breeder of Toy and Miniature Australian Shepherds, located just outside of Reno Nevada near the Northern California border. We are members of NAMASCUSA and ASDR registries. Our focus is to better the breed with good genetics, conformation, temperament and beauty is a bonus. Our puppies get the quality care and attention they need before they go into their new homes being handled daily. 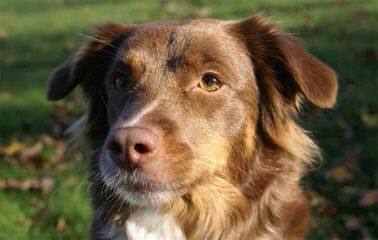 We raise our dogs in our home around children, cats, horses and other dogs so they are well rounded and friendly. 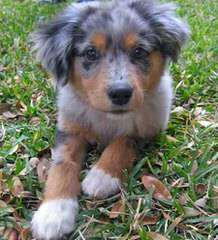 Located in East Texas, Rockin’A Aussies are dedicated to breeding and producing top quality Miniature and Toy Australian Shepherd dogs. 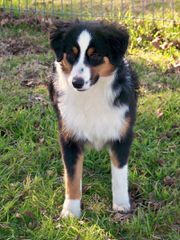 In our breeding program we pay special attention in selecting Sires and Dames that will produce a top quality offspring that meets and exceeds the standards of the Australian Shepherd Breed. 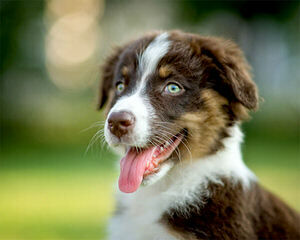 At Rockin’ A Aussies we interact with all of our dogs and puppies several times a day, everyday. Our dogs and puppies are exposed to children, other dogs, cats, chickens, horses, and cows everyday on our property. Our 3 children spend countless hours with our dogs and puppies. This ensures that any dog purchased from us will be friendly and will already have a good start to becoming a great companion or working dog for you. We provide all of our dogs and puppies top quality veterinary care and we give all recommended vaccines and procedures that are age appropriate for the dog or puppy. 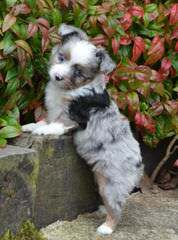 All of our dogs will be sold with a health guarantee at the time of sale. 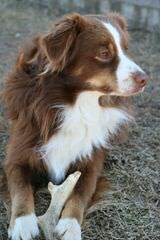 Whether you are looking for an amazing dog to work, show, or be a great companion a Miniature or Toy Australian Shepherd from Rockin’ A Aussies is sure to fit your needs and exceed your expectations. Please contact us with any questions about any of our puppies. We look forward to hearing from you. 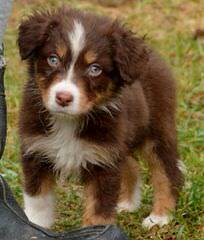 Awesome mini aussies available. Registered males and females. All colors available. Up to date on vaccinations, deworming, flea/tick prevention. Comes with a FL Health Certificate. Cute, cuddly puppies ready for you to love! $400-$600. Call or check out our website for availability. Located in the Foothills of NC, our goal is to produce high quality loving companions. 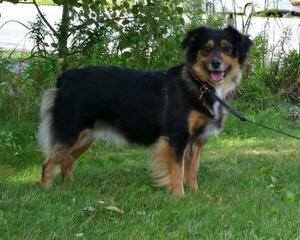 All of our Aussies are in home raised and are well socialized with children and animals. 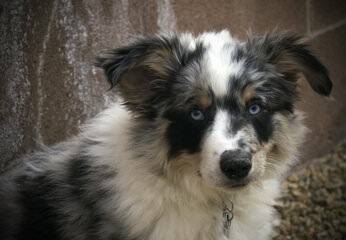 We are a small farm located in the foothills of the Catskill Mt’s in NYS raising quality mini’s with true Aussie type. We breed specifically for wonderful dispositions and all health testing is done to be sure your new family member will lead a long, happy life with you. Our pups are raised right here in our home; never a kennel environment and well socialized. Raised with other dogs, cats, horses and chaos going on! Please call or visit our website to join our ever growing Aussie family today! Also find us on FB for tons more pics! 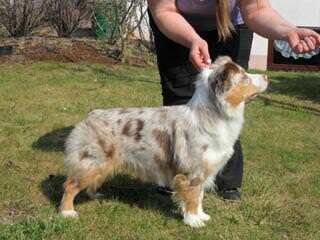 Angérs Ausome Aussies is dedicated to improving the mini aussie by outcrossing to small standard lines from HOF WTCH pedigrees with excellent health clearances. We are a small hobby breeder having only one or 2 litters a year. Parents OFA/Cerf. Pups are raised in our home, MASCA registered & 2 yr guar for hip & eyes. 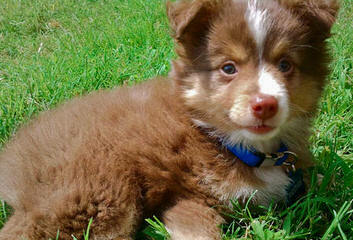 Breeding for temperament,performance,structure & great family companions.MN home grown mini aussies–Reasonably Priced! Beautiful puppies available now. 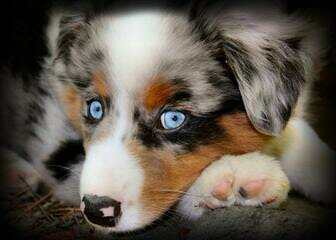 Smart and so loving, loyal wonderful family dogs. We raise only the best mini aussies. 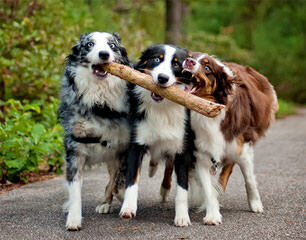 All of our dogs are Champions, health and temperament tested and guaranteed. Just in time for christmas…. 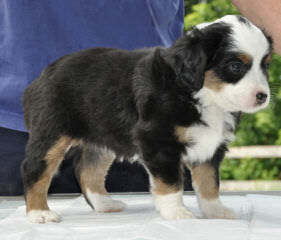 Puppies born 10/28/10, will be 8 weeks old december 23,2010…. 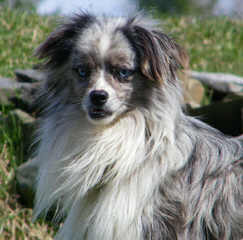 2 female blue merles, 2 female black tris, 1 male blue merle… Registered NAMASCUSA.. $600..
We are a small hobby breeder, showing and raising quality mini aussies. Our dogs roam our 4 acres, go camping with us and go with us riding our horses. The puppies are raised around children, have one shot, wormed and come with a health and temperament guarantee. We do health checks on our adults and the puppies are registered with MASCA and NAMASCUSA. 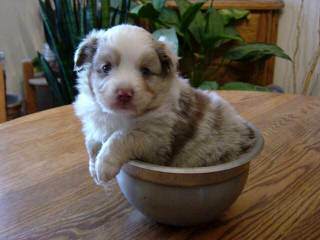 I have 5 mini aussies at stud, raise puppies sand enjoy them as part of the family.. All my breeders are CERF’d yearly and puppies are raised in my home and handled every day. References are available and for more information you may call me anytime. 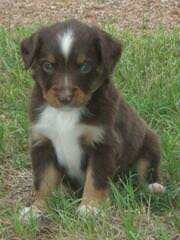 I will not have any more mini’s until next summer..
Toy And Mini Aussie Puppies For Sale.